A lake in a Melbourne park has naturally turned pink, drawing throngs of admirers keen to snap a rosy picture. The man-made salt lake in Melbourne's Westgate Park has turned a striking bright pink in recent weeks. The vivid shade is produced by lots of sunlight, low rainfall and warm temperatures. In those conditions, the lake's algae produces a red pigment called beta carotene. The result has seen tourists flock to the waters almost every summer since 2013. Some dress up and colour co-ordinate for their pictures against the pink background. However, authorities ask visitors not to get too close, as the water's high salt levels can irritate sensitive skin. On social media, people also warned others of a pungent "rotting eggs" smell. The lake's pink colour typically lasts through to late Autumn, until cooler temperatures restore it back to blue . 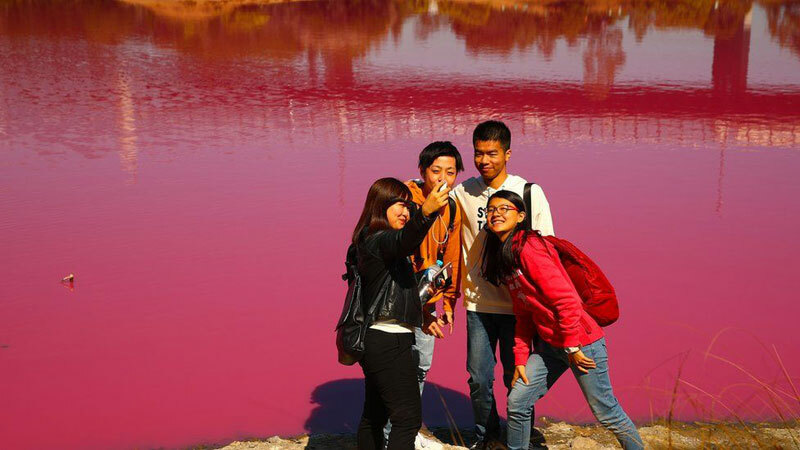 The phenomenon can be seen in other pink lakes in Australia, Spain, Canada and Senegal.